Click on each title to see the poster! Hallinen, N.R. & Booth, J.L. (2018, June). 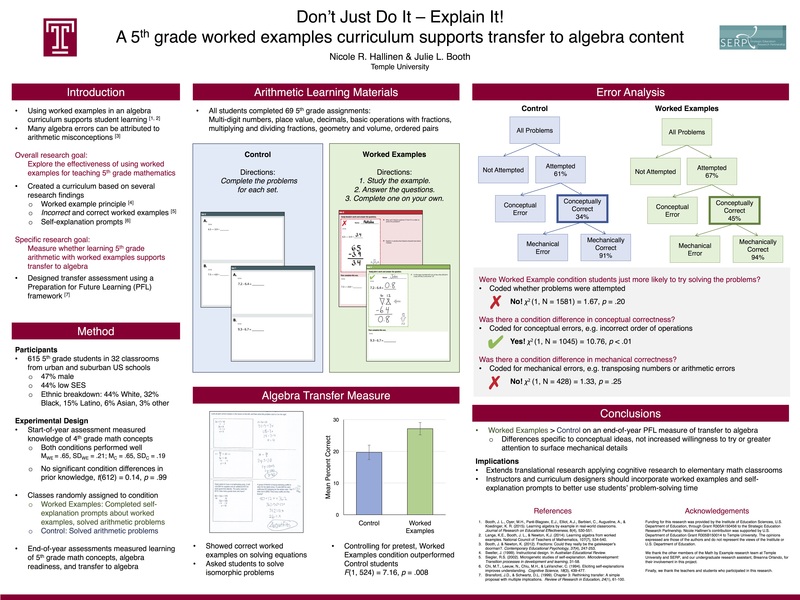 Don’t just do it, explain it: A 5th grade worked examples curriculum supports transfer to algebra content. Poster to be presented at The International Conference of the Learning Sciences (ICLS), London, UK. Ham, L., Hallinen, N.R., & Gunderson, E.A. (2017, October). The influence of narrative context on children’s proportional reasoning performance. Poster session presented at the Cognitive Development Society, Portland, OR. Hallinen, N.R. & Booth, J.L. (2017, October). More to the story: Students’ performance on equations and story problems involving algebraic proportions. Poster session presented at the Cognitive Development Society, Portland, OR. Black, C., Hallinen, N.R., & Gunderson, E.A. (2017, April). 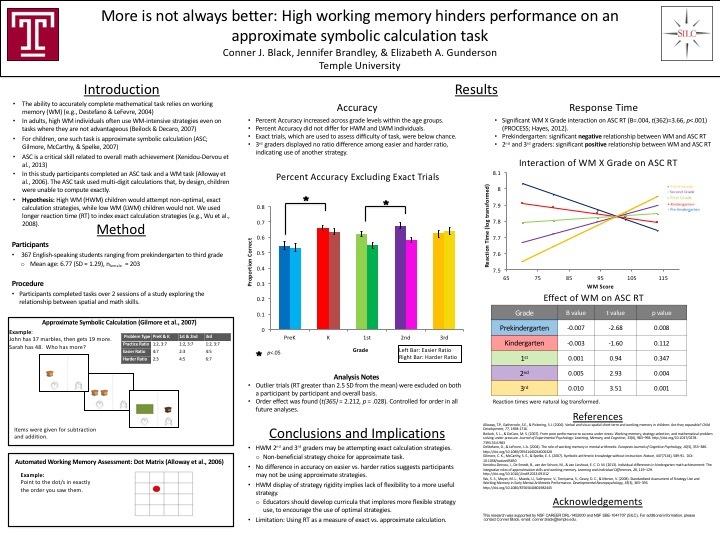 High working memory hinders initial performance on approximate symbolic calculation, but practice leads to a strategy shift. Poster presented at the Society for Research in Child Development, Austin, TX. Hamdan, N., Ham, L., Hallinen, N.R., & Gunderson, E.A. (2017, April). Linear measurement skill mediates the relation between mental transformation and number line estimation in young children. Poster presented at the Society for Research in Child Development, Austin, TX. Hallinen, N.R. & Booth, J.L. (2016, December). Does solving for X help you solve in context? Investigating component skills that contribute to word problem solving performance in algebra. Poster presented at the IES PI Meeting, Washington, DC. Hallinen, N.R. & Schwartz, D.L. (2016, November). Knowing When It No Longer Works: One benefit of inducing a solution. Poster presented at the Annual Meeting of the Psychonomic Society, Boston, MA. Hallinen, N.R., Newcombe, N.S., & Dziembowski, Z. (2016, July). Drawing attention: Do sketching and problem-solving frameworks support student thinking? Poster presented at the Physics Education Research Conference, Sacramento, CA. Hallinen, N.R. (2016, April). Examples and mathematics: How to design physics materials for learning and transfer. Invited poster presented at the 2016 Annual Meeting of the American Educational Research Association, Washington, DC. Hallinen, N.R., Cheng, J., Chi, M., & Schwartz, D.L. (2014, June). Tug of War – What is it Good For? Measuring Student Inquiry Choices in an Online Science Game. In Polman, J. L., Kyza, E. A., O’Neill, D. K., Tabak, I., Penuel, W. R., Jurow, A. S., O’Connor, K., Lee, T., and D’Amico, L. (Eds.). Learning and becoming in practice: The International Conference of the Learning Sciences (ICLS), Boulder, CO.
Hallinen, N.R., Chi, M., Chin, D.B., Prempeh, J., Blair, K.P. & Schwartz, D.L. (2012, August). Applying Cognitive Developmental Psychology to Middle School Physics Learning: The Rule Assessment Method. Poster symposium presented at the Physics Education Research Conference, Philadelphia, PA.
Chi, M., Chin, D.B., Hallinen, N.R., & Schwartz, D.L. (2012, August). A Comparison of Two Instructional Models Using Contrasting Cases. Poster presented at the Physics Education Research Conference, Philadelphia, PA.
Dohmen, I.M., Hallinen, N.R., Schwartz, D.L., Chase, C.C., Chin, D.B., Semmens, R., & Shemwell, J.T. (2011, March). Communicating through math and measurement. Poster session presented at the annual inter-Science of Learning Conference, Washington, DC. Hallinen, N.R. (2010). Does Negative Integer Instruction Transfer to Negative Rational Numbers? Stanford Psychological Studies in Education (now Developmental and Psychological Sciences) Program First Year Project Symposium. Hallinen, N.R., Walker, E., Wylie, R., Ogan, A., & Jones, C. (2009). I was playing when I learned: Developing and evaluating a narrative game for French aspectual distinctions. Carnegie Mellon University Meeting of the Minds Symposium. Hallinen, N.R. & Siegler, R.S. (2009). Filling in the Gaps: Creating an online tutor for fractions. Carnegie Mellon University Meeting of the Minds Symposium. Hallinen, N.R. (2008). Effective, Useful, Interesting? : An evaluation of the Carnegie Mellon Online Writing Tutor. Carnegie Mellon University Meeting of the Minds Symposium. Hallinen, N.R. & Siegler, R.S. (2007). Scaling Up: The effectiveness of playing a life-sized board game to learn early mathematics. Carnegie Mellon University Meeting of the Minds Symposium.